We are all spirit souls and part of God, according to Gita, and Krishna is svarat which means he is completely independent. As parts of the supreme Lord, we also have independence. People can take away your money , material nature can take away your health, time will take away your youth, everything is taken away from us inevitably, but there is one thing that no power in all creation that can take away from anyone in this human form of life, and that is our free-will. This is all important. Alcoholism is same thing. Drug addiction is same thing. You use your free-will, you do it enough times and soon you become so much conditioned by the modes of nature that you are willingly surrendered to that. It appears that you lost your free-will. But in fact, you haven’t. So whatever our consciousness is, whatever our way of thinking is, we should understand that it is not our nature eternally, it is our acquired nature. It is the nature, the characteristics that we have created ourselves according to what and who we choose to we associate with: in our lives, in this life, and in our previous lives. When we take birth, according to Bhagavad-Gita, according to the characteristics we have acquired, we have a particular state of consciousness in this life. Some people are very dynamic. Some people are just really lazy and lethargic. It is not that one is just born that way. It is through choosing lethargy in this life, may be in previous lives, that that becomes your nature to be lazy. Some people, by nature, just cannot stop complaining about everything and everyone. Have you ever met anyone like that? They just love to complain. In fact they may not love it, they cannot stop it. It is through complaining and complaining and associating with complainer that you develop that aptitude that attitude. Similarly, when we associate with people who are positive, and when we choose to engage in a positive perspective, with positive activities, then we are reconditioned ourselves in that way. But this is the special virtue of human life that we always have a freedom of choice. This whole world is a mirror of our own consciousness. Nobody sees the same thing in this world in the same way. Whatever and whoever we come in contact with we are going to see according to our own state of consciousness. The world is just a mirror of our own attitudes. One person sees, “Look at this rose bush, it is full of thorns,” and keeps grumbling about the thorns on the rose bush. Another person rejoices, “Look at the thorn bush, it has a rose!” So, they are seeing the same thing, but are they seeing the same thing? No! If you have rose colored glasses, everything will look rose colored. If you have yellow colored glasses, everything will look yellow. If you have green colored glasses, everything will look green. If you have clear colored glasses, you see everything as it is. So yes, according to our state of consciousness we have certain attitudes, and we will perceive reality according to our acquired attitudes. How we choose and what attitude we choose to adapt in situations is what is going to determine our future consciousness and our whole perception of the world. 2 Responses to "We always have the free-will, power to choose!" Such holistic perspective on the application of Free Will. 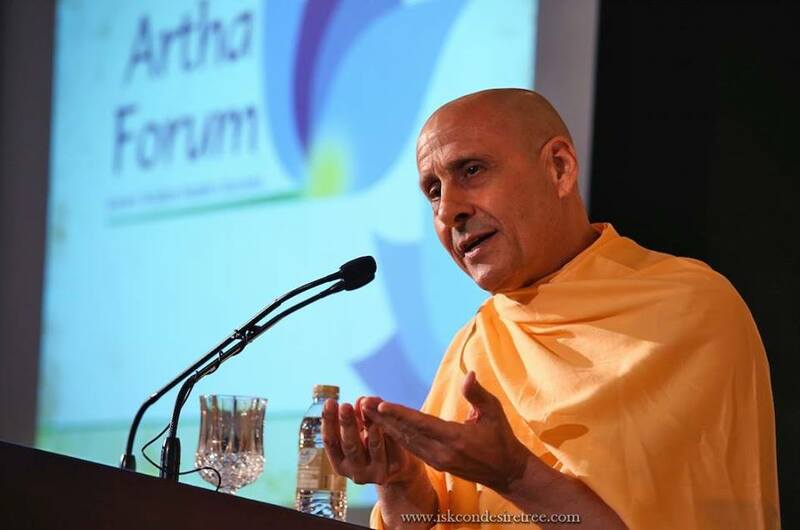 HH Radhanath Swami presents this topic with so many relevant examples and facts. Many thanks for publishing this wisdom. True. Example of rose by Radhanath Swami is very apt. The same rose is perceived different based on our consciousness.